I wasn’t expecting to win. It was such a shock when my photo came up and I was named. This is definitely a great achievement. 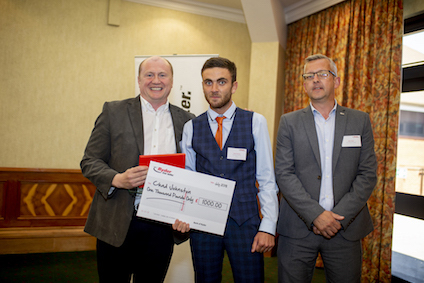 The award is given out annually to Ryder’s graduate technicians at a ceremony to mark the end of their three-year training programme, and the start of their career as a fully-qualified technician with the company. Now in its seventh year, the event recognises technical excellence, work quality and all-round performance among Ryder’s highest-achieving graduates. On average, the firm recruits 12 apprentice technicians each year as part of its investment in training. The technicians will support Ryder’s customers in its network of 23 locations, keeping around 20,000 trucks, trailers, and vans on the road. Chad Johnston was presented with the award by David Hunt, Ryder’s Vice President and Managing Director for Europe, and Mark Carlin, Ryder’s Head of Operations Development, at a ceremony at the National Motorcycle Museum. Chad was rewarded with £1,000 in prize money and a VIP week-long trip for himself and a guest to the US to see the live finale of the Ryder Top Tech Recognition Program for North America in San Antonio, Texas. Chad wasn’t the only winner at the ceremony: Alfie Brockwell at Heathrow was named Apprentice of the Year 2018 – Year One; Jamie Stanfield at Glasgow was named Apprentice of the Year 2018 – Year Two; and Jack Goodwin at Fenstanton was named Apprentice of the Year 2018 – Year Three.